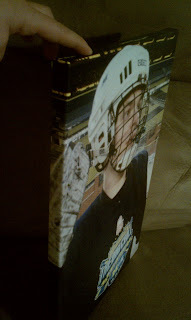 I was recently invited to try out Easy Canvas Prints, a company that puts pictures on canvas. They suggested that I might like to blow up one of my photos from a Michigan hockey game. Unfortunately, when I was in school, I had a really crappy film camera, and replaced it with an okay Kodak Easyshare after hockey season my senior year. By the time I had a real disposable income to get a nice camera, I had moved away and have only gotten to a couple of hockey games since then. 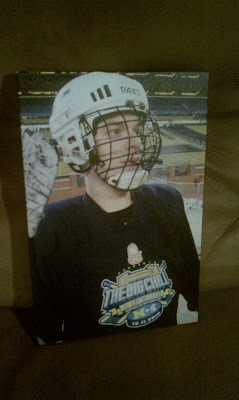 One game that we had the nice camera at was the media game for The Big Chill at The Big House. I thought it would be fun to take the opportunity to blow up one of the photos that my fiancee took me there. There's the finished product, and I think it's pretty awesome. The canvas is a really high quality, the colors pop, and they've got the ability to do some photo-shopping and other image-enhancing on your pictures if necessary. It's got a hanger built in as well. I also had the option of having a solid border or having the photo wrap around. I went with the latter option, because it looks much cooler that way and luckily the photo was taken in a way that it wouldn't cut off any of my head or the logo on my jersey to do so. It arrived at my doorstep less than a week after I placed the order, and it was packaged really well. It actually took me a little doing to get it out of the box! According to their website, due to the archival-quality material that they use, even in direct sunlight, the canvas should last for "decades to come". Their website will let you know if your file is of a good enough resolution to be blown up, and if it isn't, then they offer a service as minor-retouching to help increase the resolution. Magic. So yeah, thanks to Easy Canvas Prints for the offer! I'm really happy with how my print turned out. I've always loved the look of art on canvas. I was actually thinking about getting a couple of prints done before this offer came along, so I was really excited to take advantage and get this one printed!